Samsung has been fairly active in the Chrome OS space. The company has launched a handful of reasonably successful Chromebooks in the last couple of years. It has kept the momentum going this year as well by releasing the Chromebook Plus V2 and adding a backlit keyboard to the Chromebook Pro. It appears Samsung is gearing up to launch another Chromebook this year. We say this as the Wi-Fi Alliance has certified a new Chromebook from Samsung, hinting at its availability soon. The new Chromebook sports the model number XE525QBBI which lines up with the XE521QAB model (Chromebook Plus V2) launched this year. Other than the model number, the Wi-Fi Alliance website doesn’t reveal anything significant about the new device. New Samsung Chromebook Pro with LTE? Since Samsung already launched a “successor” to the Chromebook Plus, there is a chance this could be a refresh of the Chromebook Pro. There were reports online that Samsung might be working on a Chromebook Pro V2 with LTE support. Perhaps, this new Chromebook is that rumored model? We don’t know for sure, but it seems to be the guess in the source report. Of course, it is also possible Samsung is working on an altogether new Chromebook – something not related to the current lineup. 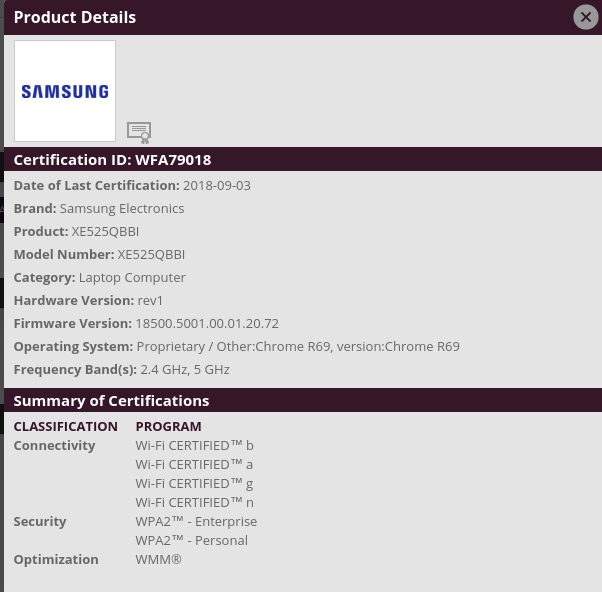 Since device certifications are an indication of an imminent launch, we probably don’t have to wait too long to find out what this new Samsung Chromebook is all about.